At what age should your child get braces? The American Association of Orthodontists recommends that children have their first visit with an orthodontist at age 7 as a good way of predicting whether or not braces will be required in the future. Although children are rarely fitted with braces until an average of about 10-14 years old, by age 7 their back teeth (molars) are established. From these molars, an orthodontist at Academy Dental in Victoria, BC can predict many potential bite problems. The types of braces for children that may eventually be recommended by an orthodontist will depend on the type of bite issue each individual child may have. Some children with bite problems may end up having only upper or lower braces, while others may require both. 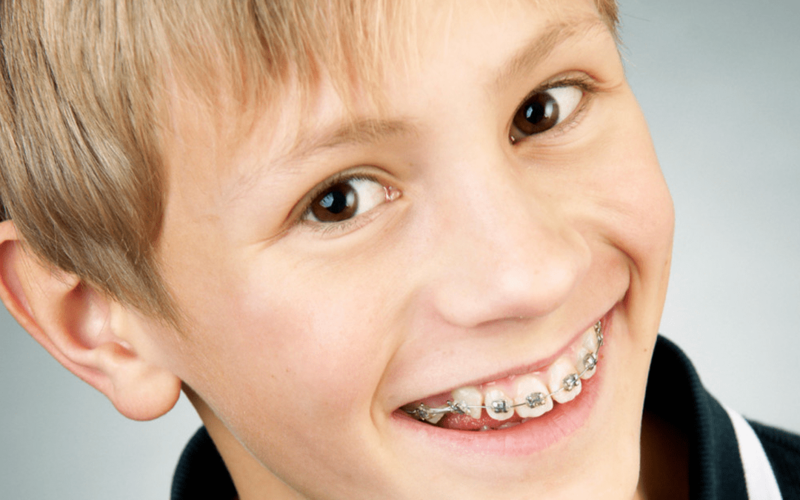 Children’s metal braces are always bonded to clean, dry teeth. Bonding primer is placed on the teeth before the wire brackets are attached with composite cement. Next, the orthodontist will attach the teeth straightening wires by placing a section of wire into the slot on each bracket. A metal or elastic tie holds the wire in the slot in these traditional braces for children. Newer types of braces don’t require the ties. Invisalign, which is a type of clear plastic and nearly invisible braces, is a popular choice today — especially for teens and adults who don’t want the obvious look of metal wires on their teeth. A good thing to keep in mind when children first get braces is that it may take kids time to get used to them. Keep on the look out for places where wires on braces for children may have come loose as sores may develop in the mouth due to wire irritating the inner cheeks. Often, simple solutions such as adding a pea-sized ball of wax or cotton over the protruding wire, can solve the problem. To learn more about children and braces or to book a first check up appointment for your 7-year-old, call the team at Academy Dental in Victoria, BC soon. Children should have their first screening by an orthodontist at age 7. This is the best age to predict if future braces will be needed to correct any bite problems. FOR META DESCR.